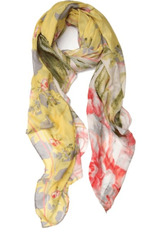 Like wearing sunshine and happiness, this light as air and soft as a kiss micro modal scarf from Elizabeth Gillett is wonderful in every way! A gorgeous print with loads of rich gorgeous colors, and an artful print that catches the eye instantly. This is extra piece to kick up your outfit to the next level!